Former trooper Eric Chin arrived at federal court in Boston on Monday. 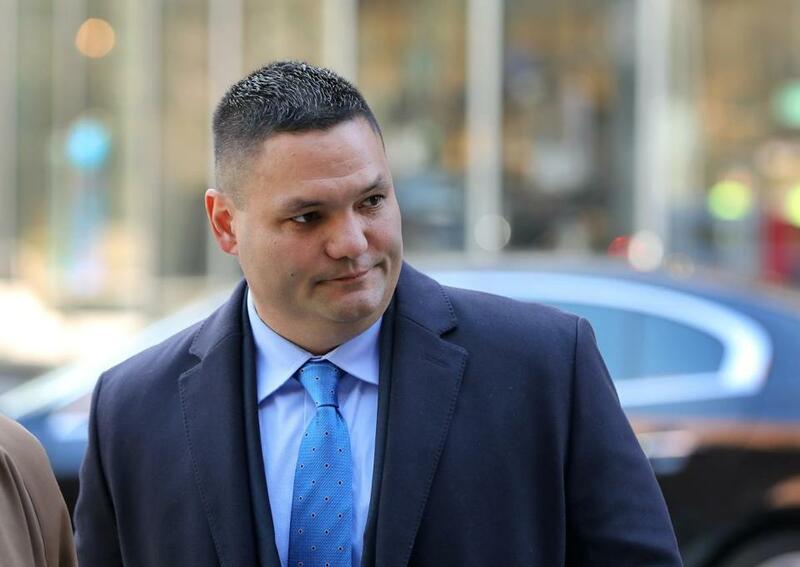 The first State Police trooper implicated in a wide-ranging overtime fraud scandal was sentenced Monday to a year of supervised release, including three months of home detention, and ordered to pay more than $7,000 in restitution. Eric S. Chin, 46, of Hanover, had pleaded guilty in December to embezzling from an agency receiving federal funds. He worked for the now-disbanded Troop E, which was at the center of an investigation that has ensnared dozens of current and former troopers. Chin pleaded guilty to receiving $7,125 for overtime shifts in 2016 that he either didn’t work or worked only part of. Chin, who was regularly one of the agency’s highest paid employees, was paid about $302,400 that year, including more than $131,000 in overtime, records show. The hours Chin skipped involved four-hour “Accident Injury Reduction Effort” overtime shifts targeting speeding and aggressive drivers, records show. Prosecutors had recommended that Chin be sentenced to three months in prison and one year of supervised release. The embezzlement charge he admitted to carries a penalty of up to 10 years in prison. Chin’s lawyer, Douglas I. Louison, described his client as a family man and said he immediately accepted responsibility for his wrongdoing. “We’re appreciative of the court’s recognition of Eric’s full life and his contributions,” Louison said after the hearing. Outside the courthouse, Chin told reporters “I feel like I treated everyone with respect” during his more than 20 years as a police officer. Chin is among 46 current and former Troop E members — representing roughly one-third of the division — who were accused by an internal State Police audit of collecting overtime for hours and shifts they didn’t work. The audit’s findings have been shared with state and federal prosecutors for their parallel investigations, leading to criminal charges against 10 members. Eight have pleaded guilty. But Louison said the agency hasn’t “fully addressed” the root of the problem. “The culture and the supervision that permitted that to occur has not been eradicated within the department,” he said. Earlier this month, prosecutors alleged in a pair of court filings that state troopers were expected to issue at least eight traffic citations per shift. Such quotas are considered unconstitutional in Massachusetts, and the department has denied using them for years. Last week, a State Police spokesman said the department doesn’t have a quota policy and current leadership doesn’t recall a time when there was. Federal prosecutors say that troopers simply wrote enough tickets to meet the quota, which often took an hour or less, and went home. Troopers also submitted fraudulent paperwork and wrote phony citations — destroying copies of tickets in at least some cases — to make it appear they had worked. In bad weather, quotas didn’t apply. Instead, troopers were supposed to redeploy, but those duties also were skipped, prosecutors said. Chin’s conviction could cost him his pension. A number of troopers linked to the scandal have retired ahead of prosecution.